Five Tribes is a four-player game. Let that blow up your brain for the next hour. Five Tribes landed in second place on our list of best board games for 2014 and with good reason. This unique, attractive, and enjoyable game is from Bruno Cathala of Shadows Over Camelot fame. My Bias: I’m a sucker for games with great art. When It's Not Worker Placement It's...? Five Tribes exists in a sort of Bizarro board game universe. It’s not a worker placement game. No, no. It’s a worker displacement game. After setting up the board, the workers are already there. Your job is picking them up and redeploying them. Here’s how it works. Pick any tile and grab every Meeple on it. Then, you drop a Meeple on an adjacent tile and keep doing so until you’re tapped out. The last Meeple must be dropped on a tile that has at least one other Meeple of the same color. You then scoop up the other Meeples of that color and activate their special ability. Five Tribes board up close. There are five different tribes. The game’s name is sort of a giveaway there. Green are merchants, able to collect items from the marketplace. Blue are builders, who score you points for every blue-numbered tile in a nine-tile radius. White are elders, who count for points at the end of the game or can be used to purchase Djinn. Yellow are viziers have no special powers, but are worth points at the end of the game. Red are the assassins. You can assassinate an opponent’s vizier or elder or you can snipe one Meeple on another tile. Not only do you get to use the special power of the tribe you picked up from the last tile, you can also use that tile’s power. That could mean the opportunity to buy a Djinn or spend some coins to pick items from the market. There are also tiles that add an oasis or a palace to the tile – both worth points to whoever claims that tile before the game’s end. If picking up the final Meeple leaves your final tile empty, you claim it with one of your camels. At the end of the game, you’ll earn the points shown in the corner. There are Djinn you can purchase. They’re worth victory points, but also have special powers. If bought at the right time, Djinn can really change your entire path to victory. Then there’s the market. There are ten different things you can get at the market. One of those is a slave. So… congrats on sacrificing your morality. Slaves have no value other than to help pay for things instead of using an elder. The other items are silk, wheat, what looks like a basket of baguettes The more unique items you collect, the more points you score at the end of the game. Ready to displace some workers? Hold your horses. Every round starts with players bidding for turn order. Coins also count as victory points. So if you’re going to spend, say, eight coin to try and go first, you better have a move in mind that will earn more than that. Five Tribes has gorgeous art. Last round occurs when someone places their final camel. Or you run out of valid moves. I went through the different avenues for scoring to try and illustrate the variety of paths you can take to victory in Five Tribes. In all my sessions, I’ve never found the foolproof plan. None of these ways of scoring (viziers, tile ownership, oases/palaces, Djinn, marketplace, saving money) has proven to be the better way. That’s the sign of solid, long lasting game design. And that’s what makes Five Tribes a game worth playing. It’s not the novelty of picking up workers or the great art – it’s the game’s stellar balance. It also helps that Five Tribes features a modular board, with tiles that are randomly placed each game. The Meeples are also randomly dropped, pulled from a bag before the game starts. This helps prevent any tried and true path to victory. This is a game about planning ahead and then re-doing your plans after someone else has ruined your move. It’s about finding the optimal score for each round. It’s a great game and worthy of being called one of the best 2014 had to offer. Lots of paths to victory. Worker displacement has been done before but it still feels novel. Players who suffer analysis paralysis can turn this into a 90-minute game. Can be hard to come back if you find yourself behind. You like Euro-style games with multiple scoring options. You don’t play with people who suffer severe analysis paralysis. You want a game where you have to think ahead, but also quickly adapt your plans. Questions about Five Tribes? Ask in the comments. 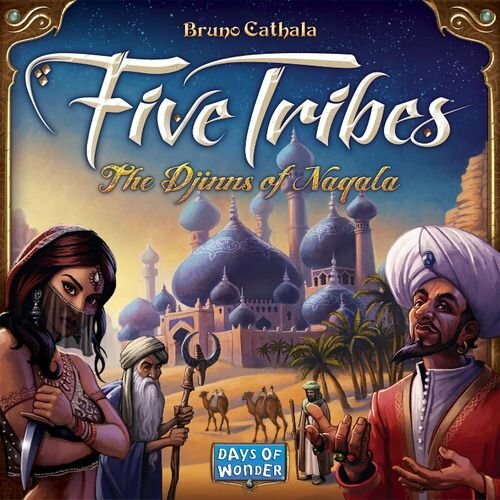 Played Five Tribes and have your own opinion? Tell us! We may feature you in the Dog and Thimble Podcast.